entire coast to the Northern tip of Croatia. As is often the case with these things some of our best discoveries were the unexpected towns we stumbled across as opposed to the larger ones the guidebooks raved about. As you drive north of Dubrovnik the landscape varies between green woodland pockets studded with piercing blue lakes and a scenic ocean drive. The Writer sent me on somewhat of a wild goose chase with tales of a pumpkin oil to which his Croatian ex-girlfriend had introduced him. He was adamant it wasn’t like olive oil or walnut oil or any other oil I named. My curiosity was sufficiently aroused; I had to buy some. I was sure I spotted bottles of it at the produce stalls dotted along the roadside but The Writer insisted that pumpkin oil was nearly black and the substance on sale was far too pale. I put thoughts of pumpkin oil aside as we made out first stop on the Makarska Riviera. The Riviera is a collection of idyllic seaside resort towns with Makarska being the largest. With its stone paved esplanade, historic town square and monastery with a backdrop of mountain ranges, it is a lovely place to spend a day. We made a brief stop there before detouring into Bosnia Herzegovina and again after departing Dubrovnik for a quick sunset swim. There are few tourists to be seen on the beaches in Makarska. After a blisteringly hot day it was absolutely heavenly taking a dip in the cool waters and looking back at the twinkling lights from the town at sunset. Once more we found ourselves in Split before travelling north through the Gulf of Kvarner. The thermometer drops drastically as you head north and the terrain is far hillier. We wound our way through green valleys, thick forests and coastal roads lashed with strong winds. The landscape is somehow more rugged than Dalmatia. Delightfully many of the smaller towns we stopped in looked like they hadn’t seen a tourist in years. In a country so reliant on tourism it was wonderful visiting areas that had no such dependence. 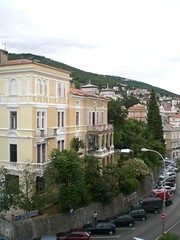 At the upper end of the Gulf of Kvarner is Opatija which, in contrast, has a strong history of tourism. Also known as the Adriatic Nice, Opatija was once the playground of the Hapsburg elite seeking a coastal retreat. The grand Hapsburg hotels still line the seaside promenade. These grand wedding cake like structures are now filled with German and Swedish tourists. As a result there is no shortage of German pastries featured in the hotel patisseries and restaurants. Many of the establishments’ interiors and menus seemed in desperate need of a revamp but it almost adds to the charm of this area. The coastal town of Opatija was our gateway to our final destination, the Istrian region. Dalmatia and Istria could easily be too different countries. The food, landscape, climate and culture are worlds apart. The pace in Istria is somehow slower than Dalmatia. It is the sort of place where you could spend days visiting quaint fishing villages and evenings feasting on local produce. Istria, particularly the coastal towns of Rovinj and Porec have a strong Venetian influence. In two hours you can find yourself in Venice during the summer months when a ferry service operates. Slovenia and Italy are also within easy driving distance. Istrian cuisine has a strong focus on local produce. Allegedly even McDonald’s has to ensure 80% of its ingredients come from the region. The pride in local produce is unsurprising given the area is famous for its potent white truffles featured on almost every restaurant menu. This delicacy is paired with meat, seafood and pasta and so reasonably priced you could almost forget they are an indulgence. Also worth sampling is Istrian sausage, which seemed to be a wonderful medley of Italian and Croatian influences. Our final stop was historic Pula. Unsurprisingly the highlight of this 3000 year old city is the old town. Also worth visiting is the Roman amphitheatre but the area directly surrounding it is undeveloped and offers little for the curious tourist to explore besides this majestic monument. The old town, however, offers an array of restaurants and shops featuring regional crafts and produce. I was sure this was the place I would secure the prized pumpkin oil that a few days of anticipation made me want to sample even more. I darted into grocery stores and delicatessens but with my severe shortage of Serbo-Croatian vocabulary, I left a trail of puzzled shopkeepers. I’m quite sure some of my hand gestures to symbolise pumpkin left a few deeply troubled. Finally one restaurateur was kind enough to give me the Serbo-Croatian name but sadly he also told me this regional specialty came from the inland villages. With a flight out of Croatia the next day it seemed I wouldn't be tasting it this time. At least I had a reason to return and explore more of this country, not that I needed one. Such an excellent post Truffle! You need to get a job working in tourism marketing. I've given you a couple of well deserved awards, the gongs are on my blog. I've often heard the Dalmatian coast is the loveliest in the world... your photos certainly make that seem true! We've only been in Istria.... time to do some more traveling. Amanda- thank you so very much! That's very kind of you. Katiez- It is stunning although I loved Istria too. I was surprised at how different they were when they are only a few hours apart. It was a pity about the oil although he tells me he only used it in salad dressings. Some googling when home uncovered it doesn't have the properties required for cooking which may be a good thing. I like my food without a black tinge! more great stories and photos - I love your search of pumpkin oil - sounds like an intriguing local delicacy! Johanna- A bit more googling has revealed there is now a producer in Australia so oddly enough I'll probably finally get to taste it now I'm back home! Sigh. We almost went to Croatia a couple of years ago but then ended up in Kefalonia instead. It was wonderful but your post reminded me why I was so keen to visit Croatia in the first place! Truffle. You saved the best photos 'til last. Stunning. A beautifully written piece. Thought of a career in travel writing? I love the photos Truffle. The colours on your camera are all very vibrant, especially the sky, which literally glows. What camera are you using? Did you tweak the photos at all in Photoshop? Wendy- definitely go next time you get the chance. I'm sure you'll love it! Thanh- I was actually lamenting the fact I couldn't capture just how vibrant the sea and sky were. I was just using a cheap camera I snapped up from duty free. No photoshop editting so am delighted you liked the colours! Your photos skillfully captured all the nooks and crannies of waterside towns tucked against cliffs. Those glittering lights at twilight and luxuriously prepared meals would make it almost impossible for me to leave. I am enjoying browsing your blog. You have some very innovative and creative dishes. Croatia is one of the destinatins next on my list. I would love to hike through the Plitvice Lake region. They even have a cooking school there which is usually part of my criteria for travelling. The benefit is two fold ; you are able to sightsee,learn a few exciting dishes, and immerse yourself in the culture with the locals.